If you are in need of mole control or vole control in Eastern Long Island, trust the proven experience of Twin Forks Pest Control to help solve your issue quickly and efficiently. 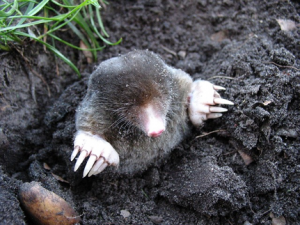 Moles and voles can be a destructive force to your lawn and garden and the damage they create can be unsightly as well as attract other pests in the tunnels they create. While they offer a bit of environmental benefit in aerating the soil with their digging, having them on your property can be a nuisance. 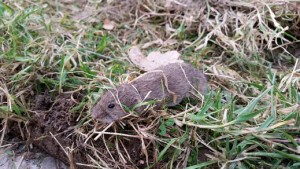 Mole control and vole control from Twin Forks Pest Control offers an effective way to rid your property of these vermin so your yard can look splendid without the intrusion of molehills popping up unexpectedly. Moles are subterranean mammals which have adapted to life underground. Their powerful front paws equip them to dig dirt effectively which is bad news for your lawn and garden. A mole’s diet mostly consists of earthworms, grubs and other underground insects and the way they acquire this food can leave your lawn in shambles. Moles create molehills when they come to the surface for air, however, because they can reuse inhaled oxygen they come to the surface with relative infrequency. However, the more moles that are present on your property, the more molehills will appear leaving your yard in poor shape. Mole control is a solution to save your property from this damage. We use our tried and true techniques to seek out moles where they reside in your yard and remove them. We use a combination of specialty baits and traps to make sure moles are dealt with effectively. It is also crucial to remove moles from your yard as soon as possible because the tunnels that they create can house other pests… namely voles. You notice plants in a garden or surrounding plant life is dead or dying. The latter condition is due to voles’ tendency to eat the roots of plant life causing the withering of plants in your yard. Another sign to look for is bark on trees that have been gnawed off as this is also a food source for these pesky vermin. Because of these potential damages, voles can be more troublesome than even moles. Vole control is a necessity if you suspect you have an infestation on your property. Their appetite for plant life can leave you with a dead lawn and garden and their tendency to either transmit disease themselves or transport disease carrying ticks makes them even more of a threat to your family. Immediate action is also necessary if you suspect voles as they reproduce incredibly quickly. According to Penn State University, female voles take only 20 days to reach sexual maturity and their litters can have as many as 11 pups each. Take into account that each female vole can also have about 12 litters per year and it becomes clear that vole populations on your property can boom in very little time. Similar to moles, we use a combination of specially formulated baits and traps to make sure vole populations are dealt with completely and totally to rid them from your yard. If you suspect an infestation of moles, voles or both pests, don’t wait. Early intervention is the best way to overcome these problems before they become a much bigger issue. Please call us at the regional number that applies to you or fill out our contact form to explain your issue. We will work with you to pick a time for our professionals to come to your home and help rid you of your mole and vole issue to protect your lawn and property. From Calverton to to Cutchogue, Twin Forks Pest Control has you covered.